Door Master Model SDM-MITER is a Door Clamp for Miter Doors (45°) and Cope and Stick Doors (90°). 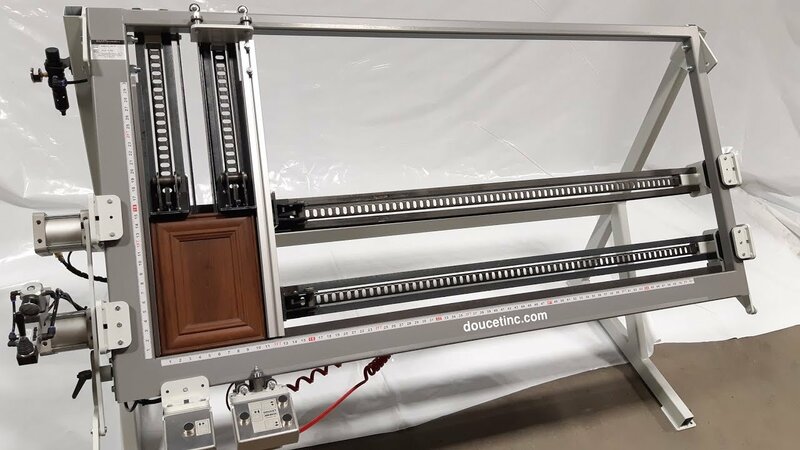 The SDM is designed for quick and accurate assembling, clamping and squaring of your cabinet doors. Door Master for Miter Doors & Cope and Stick Doors (90°) is available in two models: SDM-MITER and SDM2-MITER. The SDM-MITER model is suitable for assembly of large pantry doors up to 30" x 72" down to drawer fronts 5 ½" x 12 ½" . Standard model has four clamps. The SDM2-MITER model is suitable for double door assembly up to 30" x 48" down to drawer fronts 5 ½" x 12 ½". Standard model has eight clamps. Built on an Industrial Strength welded tubular frame, the Door Master SDM-MITER, and SDM2-MITER feature "no compromise" pneumatics - brand name air valves and real double action air cylinders. Its pedestal allows choosing a convenient working height for your operator.